Club Penguin Cheats by Mimo777 Club Penguin Cheats by Mimo777: Closed Message From Gary The Gadget Guy! He wants to know what Herbert thinks we should do to get rid of Protobot! Hmmm, that's a good question. What do you think we should do? I can't believe this... Dot AND Gary trust Herbert?? This is ridiculous!! How can they POSSIBLY trust him?? 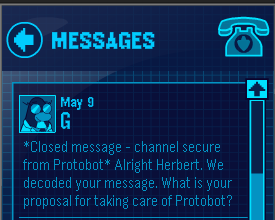 I suggest we should work with Herbert, because I think Herbert is being neglected by Protobot? Or he thinks that Protobot is more evil? PS: Why does CP dont work? I tried it and it crashes. It took him THIS long to decode it? I think we should trust Herbert. I mean just think if we stop Protobot we can have only two more villains to take care of. Plus I'd like to take a video of Herbert dancing! I trust him. I trust him very much!